Greetings from Pekanbaru, capital of the province of Riau, on the island of Sumata in Indonesia, where I have been speaking at the Faculty of Science and Technology, UIN Suska University of Riau (Fakultas Sains Dan Teknologi, Universitas Islam Negeri Sultan Syarif Kasim Riau). Along with speakers from ICT companies in Indonesia I talked on " Sustainable Development Through Green ICT: The Role of Education and the Business Sector". It is a fine sunny day and from my hotel window I can see a slightly surreal city-scape. Next to the hotel is a swimming pool full of school children and a fun park with concrete African animals, a windmill and Ferris wheel. Next to that there are the domes of a new mosque under construction and an old stone church. There is also a Madrasah (a religious school) with kids running around the playground. Further out there are ultra-modern high rise government buildings. The city reminds me of some parts of Brisbane, with the tropical heat and lush plant growth. The city is built on a flood plain, with some traditional buildings on pylons out over the water. There are modern concrete towers interspersed with wood and corrugated iron long houses. 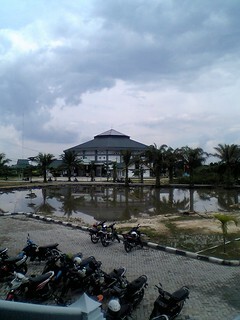 UIN Suska University of Riau is built as a series of low artificial islands within a wetland. The buildings are connected by causeways, with students using motor-scooters to commute between them. The buildings are a modern interpretation of Indonesian Islamic architecture with some local touches. While on the outside the campus looks very different to ANU, inside the building is the is the familiar bustle of students going to class. There are religious symbols on the buildings making the ambience similar to the Australian Catholic University. ps: For more on energy in Indonesia, see: Greening Indonesia's Energy by Paul Burke, ANU.